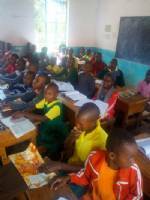 Huge improvement in Kenya Certificate of Primary Education results! Well done! This year's KCPE results in the primary schools we currently support have shown a very significant improvement.In Boka for instance the mean score has risen from 155 in 2017 to 246 in 2018. This is a real achievement in a very poor school and reflects the energy and commitment of a new headteacher and 3 new teaching staff. In Asako, where TAS has been working for nearly 8 years the score has risen from 155 to 246. Once again, a real change in a school that has been problematic for a long time. In Kaseluni where the first KCPE exam was taken last year the score has risen from181 to 230.The Ministry of Education has moved headteachers and teaching staff around in the last year and this seems to have had a good effect on school management and teaching.